R15 (Artemis) Modular Cartesian robot system, 2 to 6 axes. Handshaking or direct control of other equipment, pneumatics etc. Searching, analog measurements, timing etc. A complete robot system which is tailor-made from a range of modules for almost any workspace and payload. Used for handling, positioning, gluing, trimming and numerous other industrial and laboratory applications. Rugged and reliable, fast, accurate, easy to interface and program. R15 systems are only ever built to order after exact specifications are agreed with the customer. 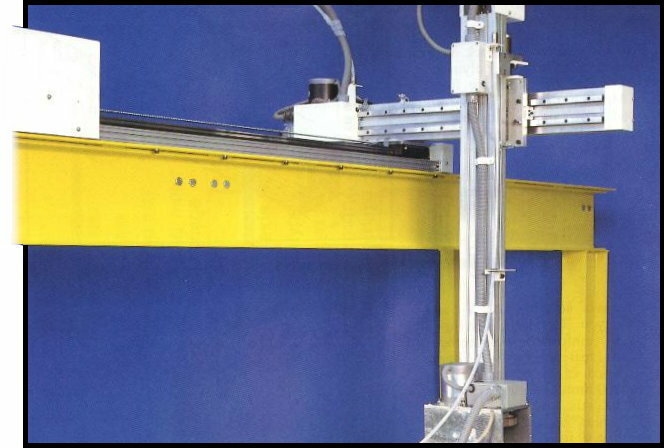 All STI robot systems are programmed in ROBOFORTH II which provides tools for synchronising robot motion with other equipment, handshaking, direct control of pneumatics, palletizing and so on. See als the N-type axis which is shown as a track on R19 page. Various gear ratios are available. The following specifications depend on gear ratios. The PR module (1) is a combined pitch and roll module. 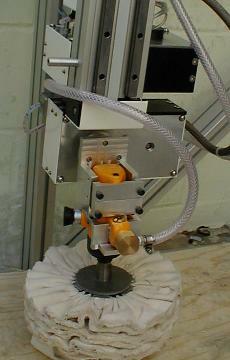 The P4 (2) is a light duty accurate rotate unit normally used as a yaw axis, often fitted to the R16 robot. 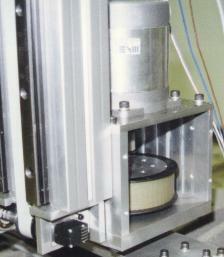 The P7 (3,4) is a high payload rotate unit also intended for yaw applications. The R2 (5,6) is a medium payload rotate unit also intended for pitch, yaw and roll applications. 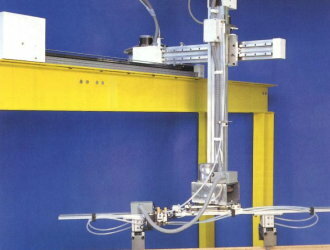 A gantry robot with long L-axis, moving carriage, K-axis, moving carriage, vertical E-axis, moving beam. 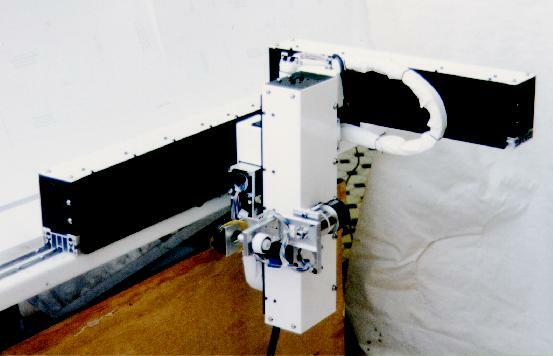 A heavy duty robot for lifting sheets of wood, made from L-axis and two K-axis with P7 rotate and heavy payload grippers. 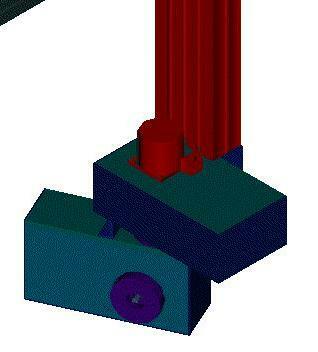 fuel injection assembly using L-axis module, moving carriage, K-axis module, moving carriage and D axis module, moving beam. 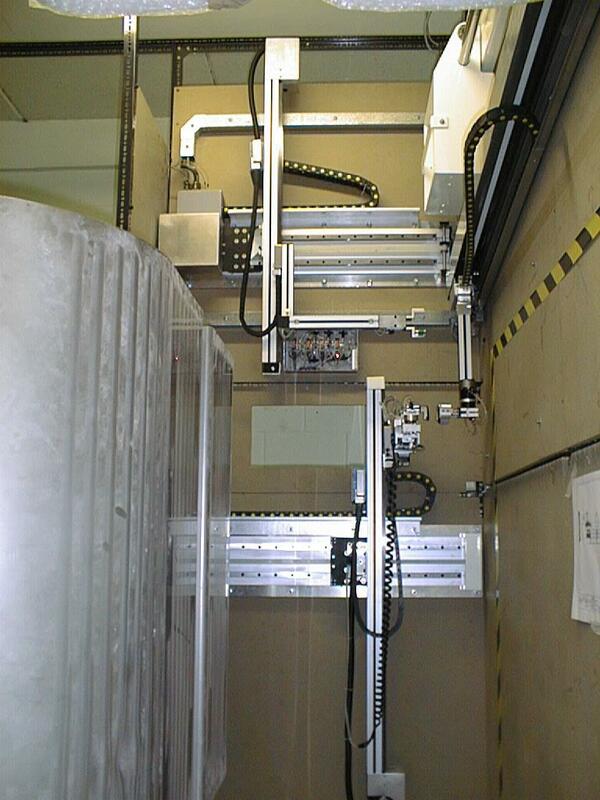 Swabbing in nuclear facility using two robots, one robot (lower) employs L, K and M axis modules. M is a telescopic axis with a yaw, not shown above. 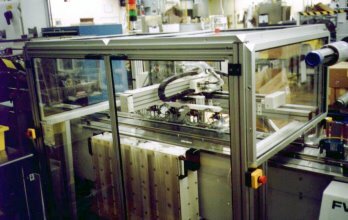 This robot passed swabs to a second robot (upper) built with L and K axis modules which passes the swab out through an electric shield door to a glove box. 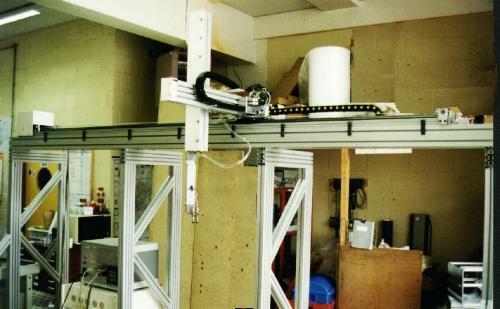 Below: X-Y robot for high speed gluing comprising 2 L-type X-axes of 3000mm stroke and a spanning K-type Y-axis of 2500mm stroke arranged in an H-shape. 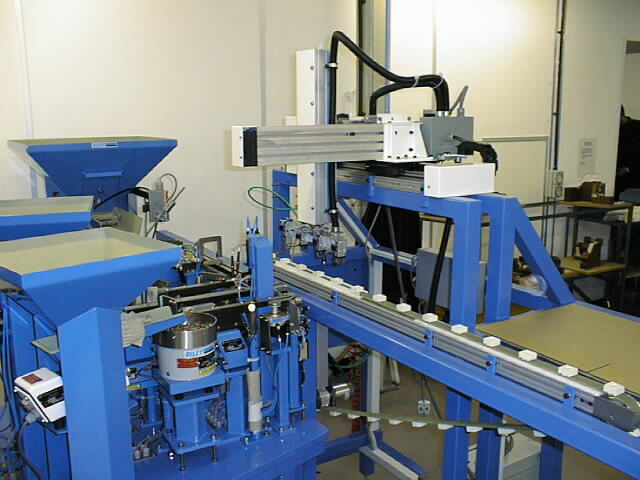 With constant velocity software it moves the same set speed in any direction, max 2000mm/sec.